EVERY PROJECT IS AN INVESTMENT IN OUR FUTURE. You will soon discover that our product speaks for itself. A family history in woodworking has given us the wisdom to select the best materials and to perfect the build methods for our cabinetry. We use the most efficient and innovative CNC machines to ensure precision and minimal waste. All cabinets are full plywood construction, natural maple or walnut interiors, Blum soft close hardware, and the highest quality multi-step, layered finishing process. We offer a full range of cabinetry options including full face frame overlay, inset, or beaded inset methods. We construct the best the industry has to offer, it is our passion and livelihood. Each project is an investment in our future, we take it seriously. 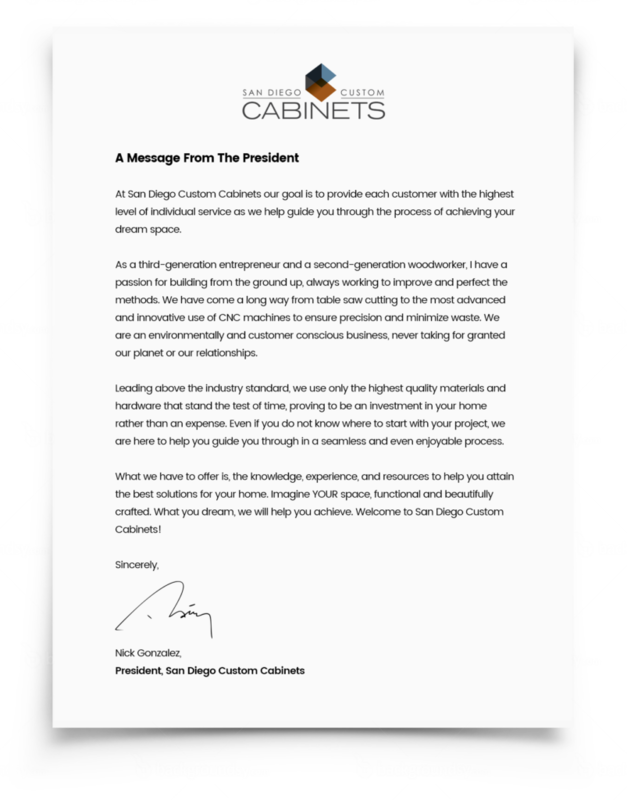 From its inception to present, San Diego Custom Cabinets is a San Diego based company through and through. It all began right here in sunny Southern Cali., where the family business resides to date. This is why we are so invested in our local clients, OUR neighbors, to provide you with a product that we would want in our own home! Building equity in our community is our greatest achievement, we take great pride in this. Treating your home like our own is the way we continue to realize this vision. Trust us with your project and you will not be disappointed.